Frank Thompson is a frequent theatre critic for JASPER, who is reviewing for his "home theatre.” Mr. Thompson wishes to freely disclose that he is employed as Box Office Manager for Workshop, is a frequent director with the company, and serves as Vice-President of the Board of Trustees. He has put on his blinders for what he thinks is a fair and unbiased review, and will do his best to deliver. A “McGuffin” is a term used mostly in film, to describe a single object or event around which a story revolves. The titular jewels in Workshop Theatre’s String Of Pearls serve just such a purpose, as a bevy of female characters find their disparate lives impacted by the temporary stewardship of a string of perfect pearls. 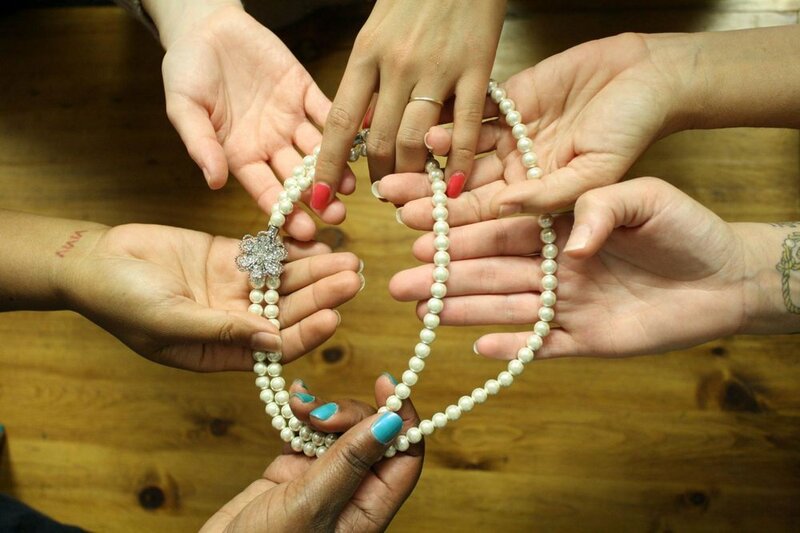 Through the passing of several decades, we see the pearls elicit joy, sorrow, confusion, and hope, along with a multitude of different emotions and reactions from twenty-seven women, played by an ensemble of six actresses. Ellen Rodillo-Fowler, Cathy Carter Scott, Christine Hellman, Krista Forster, Sandra Suzette Hamlin-Rivers, and Alyssa Velazquez, each at the top of her game, manage to create believable, three-dimensional characters, some of whom we get to know quite well, and others we glimpse for only a moment or two. Each, however, helps to move along the plot, and there is scarcely a wasted word in the script, which makes for a streamlined, well-paced production. Director Zsuzsa Manna has obviously put a great deal of thought and research into bringing each character, no matter how minor, into her overall vision. Watching the chameleon-like changes each actress made physically, vocally, and stylistically, truly created the illusion of a much larger cast. (Having known, and/or worked with most of the cast, even I had to occasionally squint and ask myself “now which one is that?”) Special commendation to Costume Designer Alexis Docktor, who created multiple eras and class levels, each of which were appealing and period-appropriate. Helping her create the magic is Wig Designer, Christine Hellman, whose skills clearly are not limited to performing. At one point, Velasquez, a natural brunette, sported thick, flowing, blonde locks that could have easily passed for a 1970s’ Farrah Fawcett hairdo, and Rodillo-Fowler’s scruffy pink punk ‘do is a true work of retro art. The set is simple, but effective. Two small platforms, a handful of moderately-sized props, and two elegant sheer curtains provide the representation for dozens of locales. Minimalism works well with this script, allowing the acting to shine as the central focus. Scenic and Sound Designers, Zsuzsa Manna and Dean McCaughan, respectively), have taken a subtle and most effective approach, with minor changes of lighting and/or the tiny ding of a single bell completely transforming the scene. Lest I seem completely biased, I will say that String Of Pearls is not flawless. At Sunday’s matinee, a line or two got dropped, but quickly corrected, and the occasional entrance seemed a bit late, most likely due to costume change issues, which tend to smooth out by any show’s second weekend. Columbia College’s Cottingham Theatre is a comfortable, easily-located facility (just GPS 1301 Columbia College Drive, and you’ll be able to drive straight to the door), and the acoustics are top-notch. Even stage whispers could be easily heard. The sight lines are clear, and the seats a bit small, but comfy. That said, it’s an older building without all the fancy bells and whistles that have now become industry standard, and has a slightly-frayed-at-the-edges feel, though I personally find that to be a charming asset to any theatre. String Of Pearls is a perfect show for those seeking an intelligent, funny, grown-up look at life. It made me think of the internet meme with words for familiar, but difficult-to-describe, feelings, specifically sonder, which is "the realization that each random passerby is living a life as vivid and complex as your own." Originally from the Dictionary of Obscure Sorrows, sonder has now entered the vernacular, and it was sonder that I felt while watching the show. One object, twenty-seven complex individuals, and one hilarious, poignant, thought-provoking trip through a cornucopia of human experiences.